Betty is of the Baptist faith and was a member of the Wallaceton Baptist Church. Other than her husband and parents she was preceded in death by three brothers, George Combs, John Combs, and Charles Combs. One sister-in-law Joan Combs. Two sisters, Thelma Combs, and Judy Combs. One step-son Michael Jones. One brother-in-law Wendell Lake. And one very special pet, her cat Miss Kitty, who preceded Betty in death by one week. 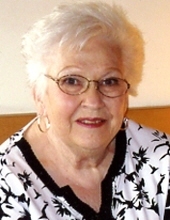 Visitation will be 4PM – 8PM on Sunday, March 24, 2019 at Davis & Powell Funeral Home. Funeral services will be 1:00PM Monday, March 25, 2019 at Davis & Powell Funeral Home with Rev. Joey Kays officiating. Burial will follow in the Berea Cemetery. Pallbearers will be, Jeff Johnson, Cameron Johnson, Doug Fritz, Harold Eden, Lothar Baumann, and Howard Mayfield. To send flowers or a remembrance gift to the family of Betty Mary Combs Jones, please visit our Tribute Store. "Email Address" would like to share the life celebration of Betty Mary Combs Jones. Click on the "link" to go to share a favorite memory or leave a condolence message for the family.